Green Curry with Potatoes and Chickpeas | Naturally. Post sponsored by La Crema. See below for more details. 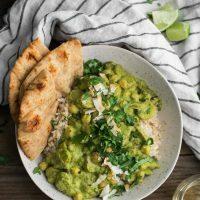 I’m rather amazed that for as many curry recipes that I post, I’ve never shared a green curry recipe. Most days, I actually prefer this curry to the red. The sauce is packed full of herbs, coconut, and just a pinch of sugar to bring all the flavors together. I look for a green curry paste in a jar then add to reach a flavorful base. 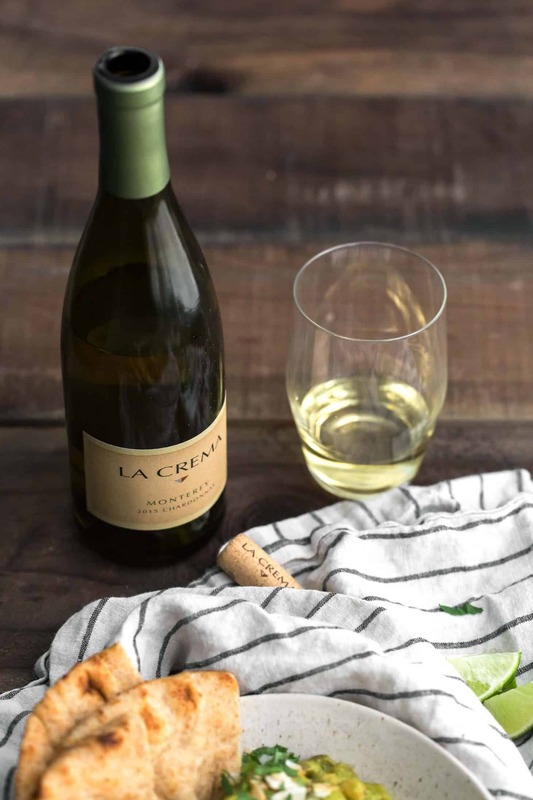 It’s the perfect compromise for an easy and fairly quick curry that pairs well with La Crema’s Monterey Chardonnay. 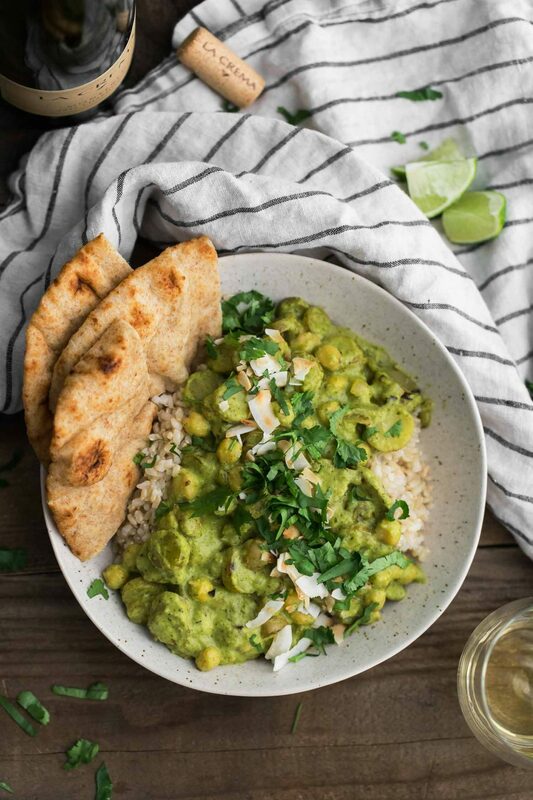 A flavorful green curry sauce that pairs well with the mild flavors of potatoes and chickpeas. Heat a dutch oven or heavy-bottomed pan over medium heat. Add the coconut oil and melt. Measure in the onion and jalapeno, cook until fragrant and soft, 4 to 5 minutes. Stir in the garlic and ginger, cooking for another minute or so. Add in the remaining ingredients for the sauce. Bring to a simmer and let cook for 5 minutes. Using a blender or immersion blender, puree the sauce until mostly smooth. Set the sauce aside and wipe out the pot. Return the pot to the stove and and add the olive oil to the pot, followed by the onion and potatoes. Saute for 8 to 10 minutes. The potatoes should be mostly tender and lightly browning. Stir in the chickpeas and the curry sauce. Bring to a simmer and cook until the potatoes are cooked fully, 5 minutes or so. Place ½ cup of rice in each bowl and divide the curry on top. Sprinkle with toasted coconut and cilantro before serving. Tips & Tricks: Make the sauce ahead of time to make quick work of dinner. Really my only suggestion for this curry is to not really mess with the sauce. Everything else is fair game! Add or swap out different vegetables, serve with grains or tofu, or add my favorite: fried cheese. Coconut Milk: Cut back on the fat a bit by using ½ cup of coconut and ½ cup of vegetable broth. Herbs: Add fresh basil and mint as desired. Grains: I’m fairly standard when it comes to serving curry over rice but quinoa would also work well (and has a quicker cooking time). Cheese/Tofu: If you’re looking to add an extra bit of heft to the recipe, top the curry with a bit of fried paneer or tofu. 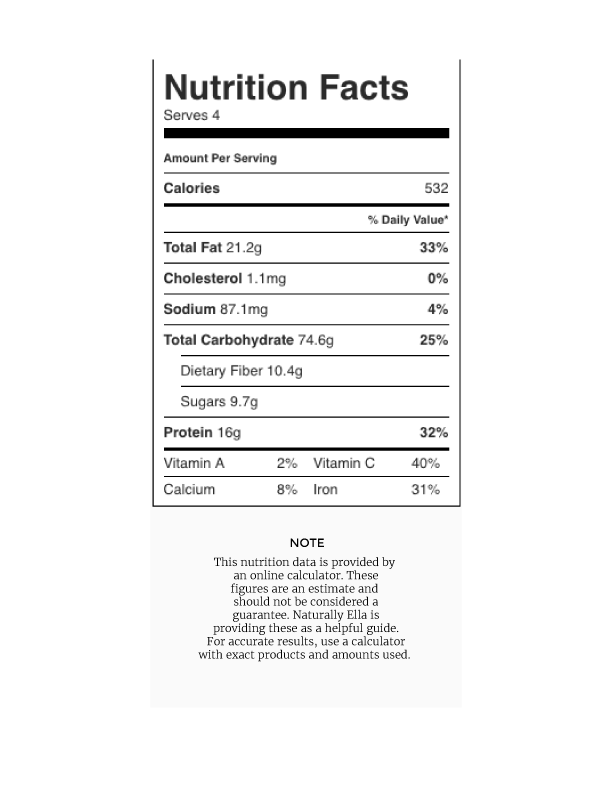 Looks delish… Is the brown rice included in the nutritional info? I’ve not tried it- you might be able to freeze the sauce! I made this it is REALLY good. I had to make 2 subs–chopped jalapenos from a jar…forgot to buy the fresh jalapeno, and I didn’t have fingerlings, so I just peeled 2 potatoes and diced into just slightly larger than the chickpeas. My husband loves chickpeas. We’ve never eater green curry. We both loved it. We made this recipe tonight and it was amazing! 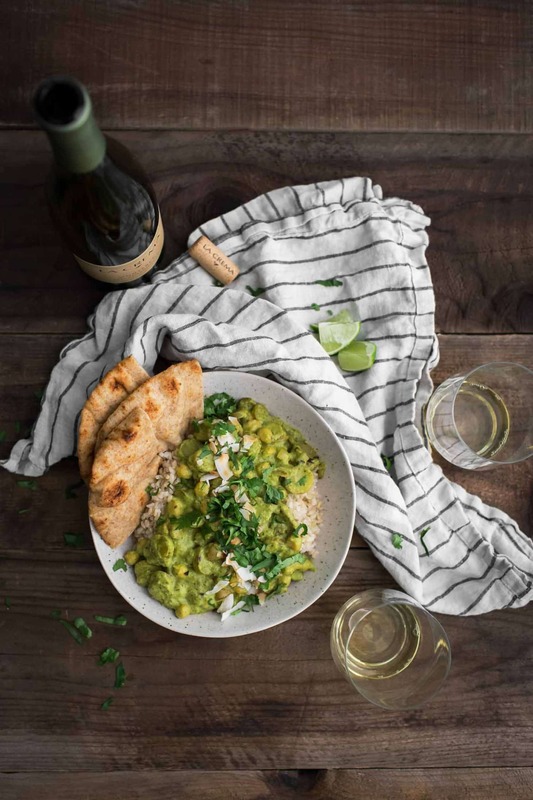 I have never done a green curry, and this recipe was easy. So tasty – will definitely make this recipe again. I made this for dinner last night, Erin, and it was delicious! Bonus that it was so easy to make. Thank you for the recipe!